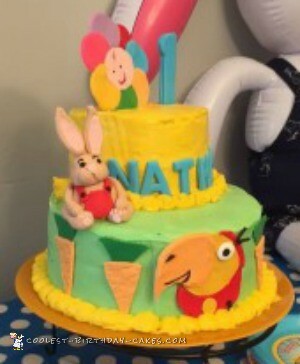 This cake was made in celebration of my grandson’s first birthday. 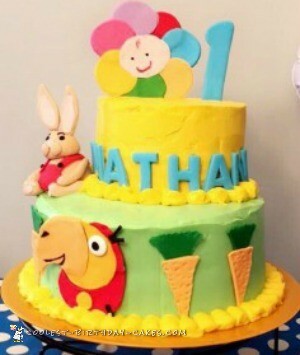 His mother wanted something different, so she decided to go with a BabyFirst themed cake. Well, I have watched the network with my grandson but didn’t know that each little segment was for a different character. I wrestled with the Harry Bunny, wanting to make a 3d rabbit; however I couldn’t come up with anything that just looked fun and happy. In thinking about it, I was speaking with my daughter in law and she texted me a couple of pictures, my question to her was which one, and she said, “no” it’s not a show, but each little character has it’s own 15 minute segment to teach the little one something. Well this intrigued me, so I did the “google” and looked at the channel and just decided to incorporate each character that we watched together. Mind you this was the night before his party, I live in Alabama, I had to make pieces, and pack them for a two hour trip to Ga, and put the cake together there. 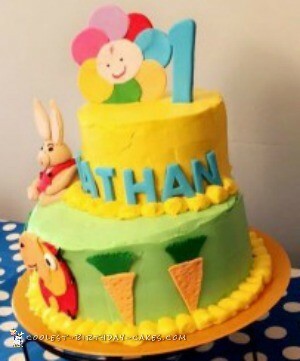 Everyone loved the cake, loads of compliments and I truly enjoyed making his first birthday cake.